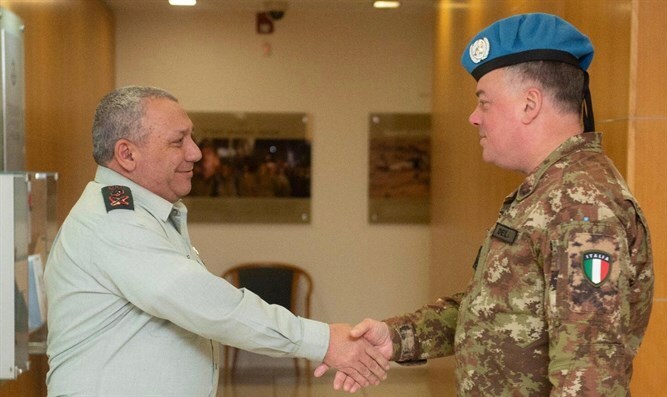 On Sunday, IDF Chief of the General Staff, Lt. Gen. Gadi Eisenkot held a meeting with the Head of Mission of UNIFIL, the Italian General Stefano Del Col, to discuss the ongoing Israeli operation on the Israel-Lebanese border to locate and neutralize cross-border tunnels. Last week, the IDF launched Operation Northern Shield to destroy Hezbollah terror tunnels built from southern Lebanon into Israel. The tunnels mirror similar terror tunnel networks used by the Hamas terror organization in the Gaza Strip for both internal transit within the coastal enclave, and for attacks on Israeli targets outside of the Strip. During their meeting, the Chief of the General Staff emphasized that the terrorist organization Hezbollah’s attack tunnels, which stretch into Israeli territory, are a blatant violation of UN Security Council Resolution 1701 and were intended to be the surprise element of Hezbollah’s plan of attack against Israel. The Chief of the General Staff, Lt. Gen. Gadi Eisenkot, presented the progress of Operation “Northern Shield” and expressed the importance he sees in UNIFIL implementing the UN’s resolutions, working to neutralize the tunnels from the Lebanese side and preventing violations of the resolutions by the terrorist organization. The Chief of the General Staff further emphasized that the responsibility for the construction of these tunnels by Hezbollah in South Lebanon lies with the Lebanese government. ← Schindler’s List – and then what happened?